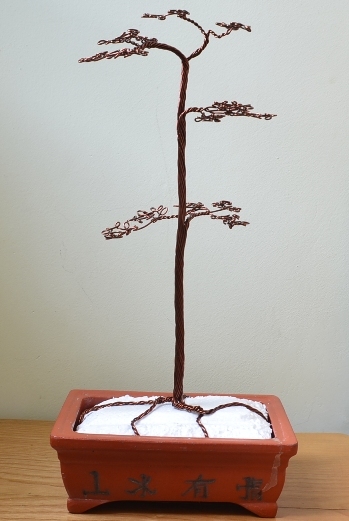 How do you think about a wire bonsai tree? Have you ever seen one? I’m talking about bonsai made by strings of metal wire. To the fans of miniature trees, this is an interesting aspect. Because it’s another way to enjoy the hobby: to make a bonsai tree from artificial materials, other than natural botanical species. Do you believe that we can make a beautiful artificial tree from metal? Look at the tree in below pictures, you’ll have the answer. Isn’t it so cool? Surely it is. Why a wire bonsai tree? 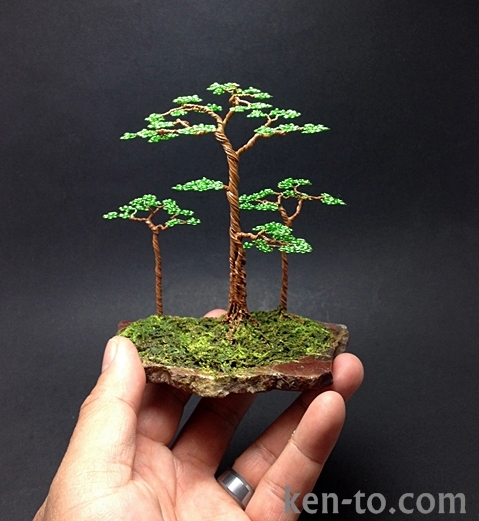 Yes, living bonsai is naturally beautiful, but wire sculpture bonsai has its own advantages as follows. You don’t need to take care of: no watering, fertilizer, pruning, pets or diseases etc. Surely it’ll never die, and thus very suit an amateur or a lay man. At most, you only need to make or buy one, then leave it in your desired place, it’ll maintain the same style over time. The only except case is when you damage the tree by yourself, e.g. drop it hard, or put a heavy thing on it. It’s very easy to bend and undo if you want to change its bonsai style. Being metal, it’s easily stay in new position and really difficult to break like real plants. In case you don’t like the new style, just un-bend it. With that characteristics, wire tree is a very useful tool for practicing styling bonsai. To bonsai artists, sculpturing metal bonsai product takes less time than nurture a real tree. Though time consuming, making artificial mental tree takes some hours, maybe days, or even weeks. Such duration are definitely much shorter than several years training real bonsai. Inspired by the idea of “immortal” artificial tree, I made several for myself. Admittedly, it’s time consuming, but it’s really interesting, as much as training real bonsai. My works is still far from what is made by professional artists. But it looks good enough (without moss yet), isn’t it? I wish some day somebody’s willing to pay for my works, lol. This may not be tutorial yet, but I hope you can find it useful for your reference. Prepare metal wire, preferably copper or aluminum strings; a pot; soil; and artificial moss. Metal string thickness should be tiny so that they can be easily bent. With metal in large diameter, you will get difficult in bending or twisting. Besides, large string will make leaves to look “metal” and not natural. The length of strings depends on the height of your desired trees. As my estimation, they should be twice as long as the wanted height from tree top point to root tip. Accordingly, string for highest branches should be longer that those for leaves at lower branches. Prepare separately number of strings necessary for each branch. For example, for top foliage you want to have a small branch with two strings, then pick up two, and so on. You’ll make each branch separately first. Branch thickness follows those of natural trees: smaller at top, and larger downwards. Make leaves by curving around one end of string into continuous circles. You’ll decide yourselves number of leaves (circles), but at least 5-6 to look thick enough. Select 2-3 strings to create top canopy, twisting them together and then bend the branch to have initial curve. Repeat the process to make other lower branches and foliage. Remember to add more string to have lower thicker branches larger. When you have enough branches ready, it’s time to assemble all together. Do from the top branch to the bottom. Twisting all metal branches together, and try to make the trunk to have natural look. This will be a little hard at first, as branches basically are strings which tends to loose apart instead of sticking together. You have to use twisting force to hold those separate strings to make one trunk. Downwards the base, you’ll make roots. It’s similar to create branches. Just choose 3-5 strings and bend together to have big root, and less strings for small roots. Outwards a little, say one centimeter, divide into two small roots, just imitating a real tree’s surface root. At last, put the complete tree on the soil in a bonsai pot. Cover the soil with fake green moss to have natural feeling. You can also curve the trunk and branches to get the optimum shaping. That’s it, now you have created a metal wire bonsai tree. Congratulations! Look at it again, you like it? Absolutely, right? Spending hours for a tree, you surely love your time and effort. You want to share your feeling now? Go ahead and give some words. I’d love to hear from you.